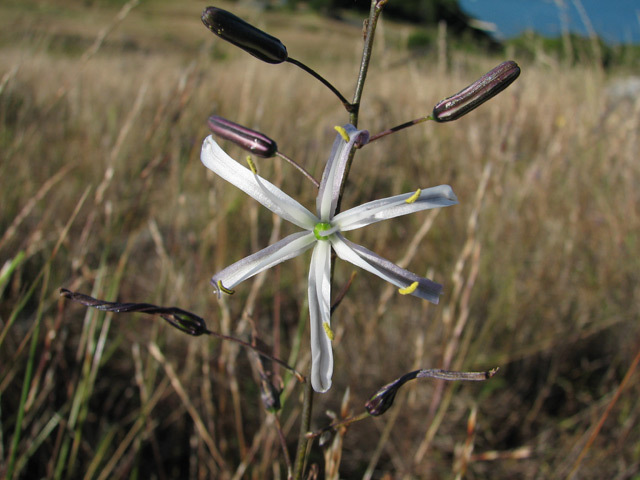 Chlorogalum is a genus of five species mostly from California but extending into Oregon and Mexico. 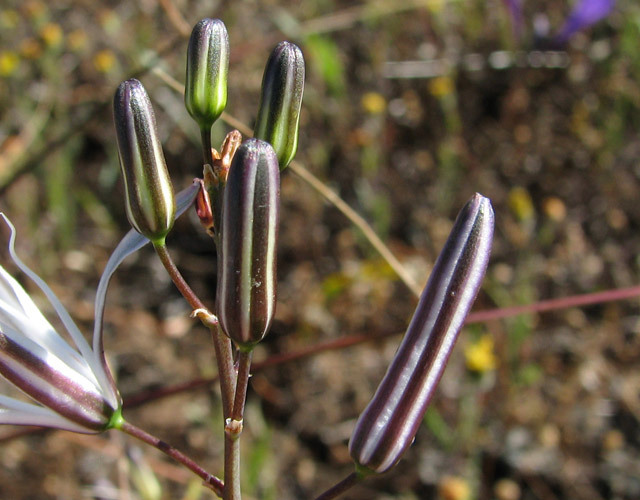 Formerly considered to be part of the Liliaceae family, Dahlgren placed this genus in the Hyacinthaceae family, but DNA now suggests they be assigned to the Agavoideae subfamily of Asparagaceae. 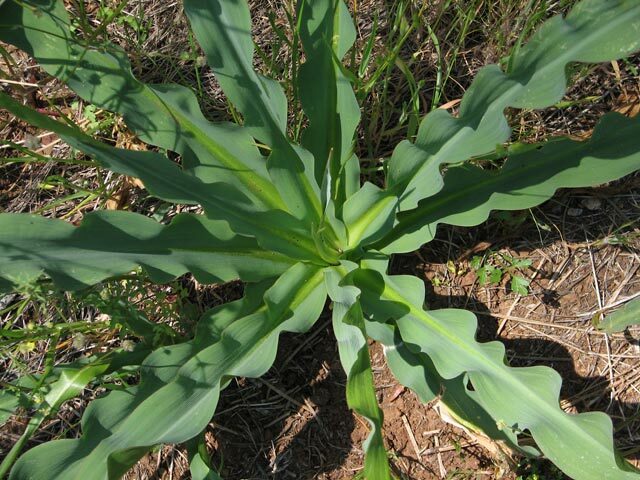 They produce long, basal leaves with tall loosely branched stems with starry flowers. 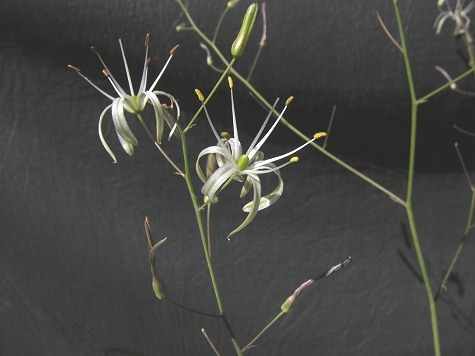 Chlorogalum parviflorum S.Watson is a somewhat smaller version of C. pomeridianum, with smaller flowers and bulbs. 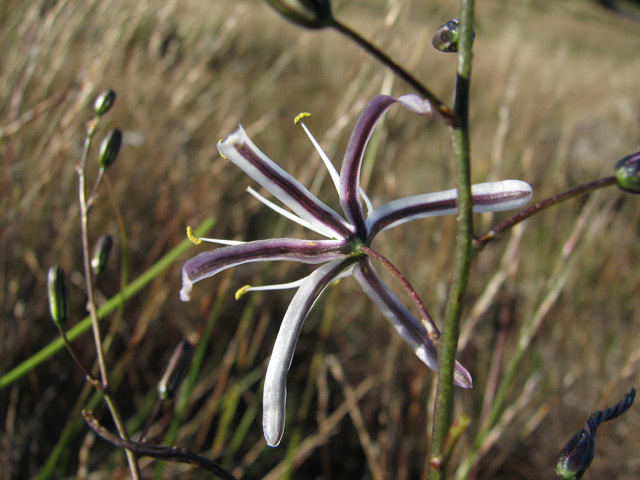 Its range is restricted to California's South Coast floristic province. The flowers open during the day. They are quite common where I live in San Diego, especially in Mission Trails Regional Park. Photos from Jim Duggan. 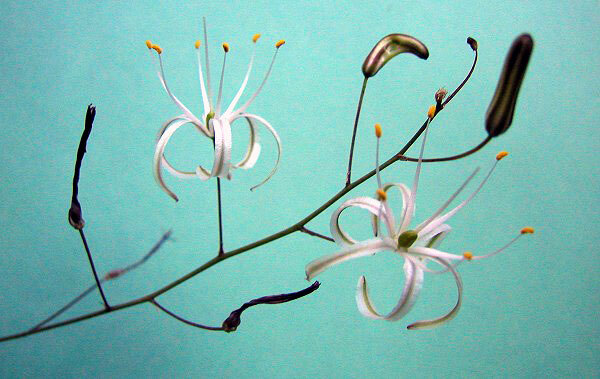 Chlorogalum pomeridianum (DC.) 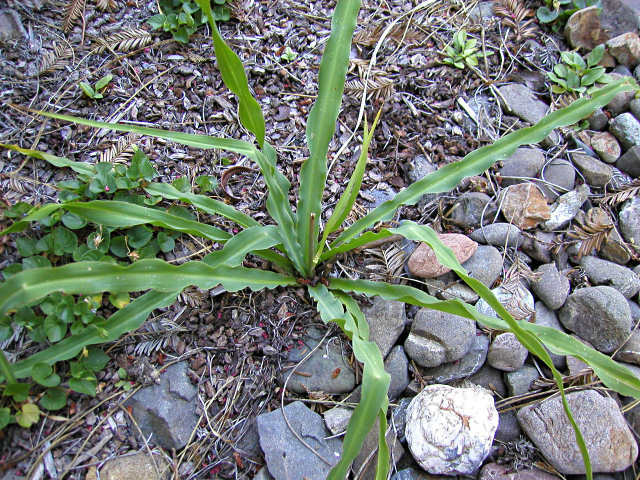 Kunth is a bulb found on grassy road banks, open meadows, and slopes in southern Oregon and California. 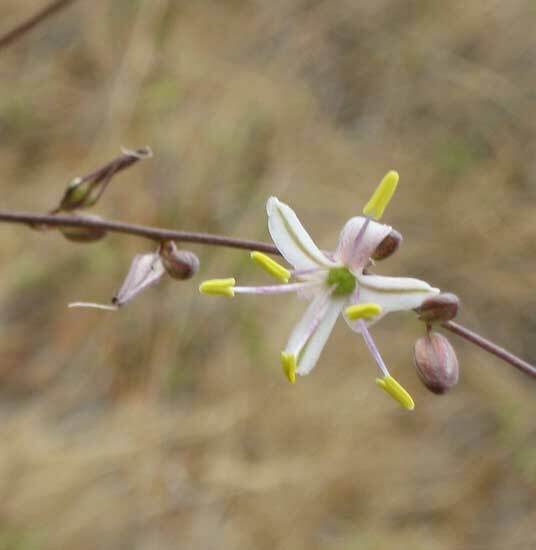 It has basal rosettes of attractive wavy margined leaves that appear late winter, widely branched panicles of fragrant flowers that bloom in summer, and fibrous-coated bulbs. 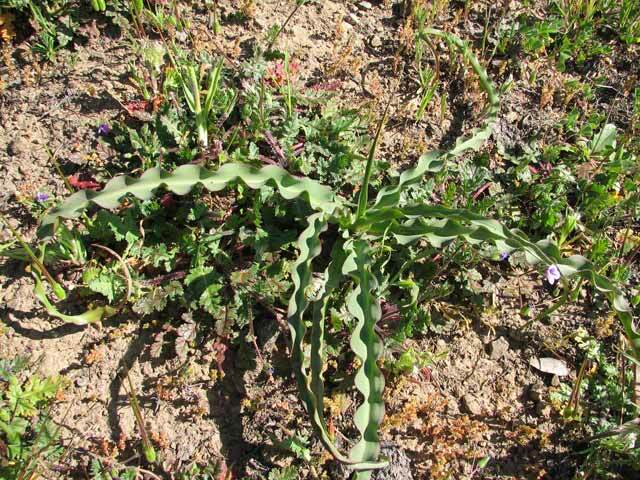 The leaf margins have various degree of undulation based on sun exposure. 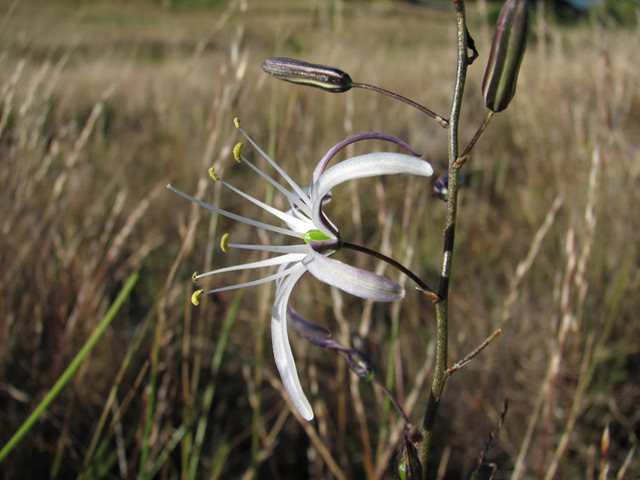 The flowers open late afternoon, are pollinated by night insects, and fade by morning. 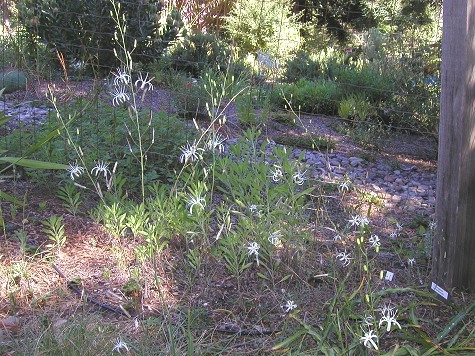 Flowers appear over a long period. 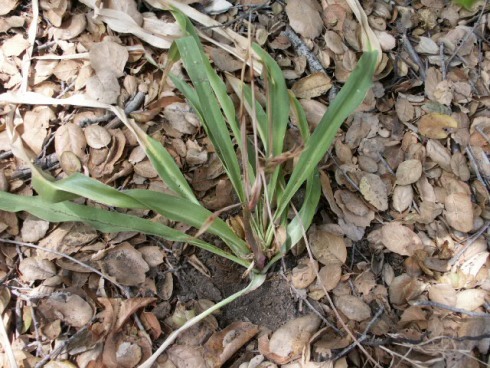 The plants have a brief dormancy in fall. 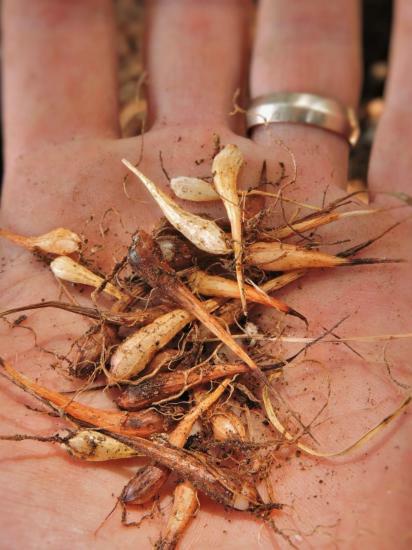 This one is an easy garden plant that can be grown from seed. The first four photos by Bob Rutemoeller show the leaves, close-ups of the small flowers and a number blooming late afternoon. It can increase a bit too much in places where it is happy and deer cannot get to the flowers, but still makes quite a nice sight late afternoon and early evening with all the starry flowers. 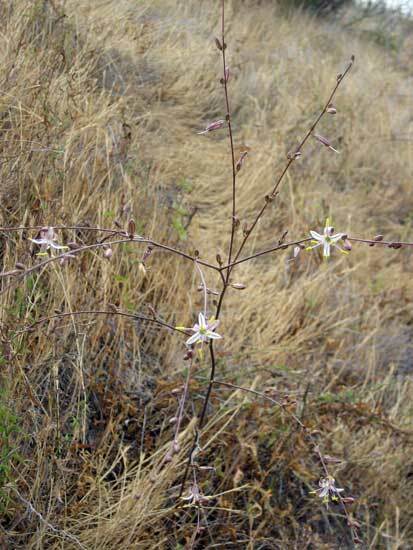 Photo 5 from John Ingram is of a one growing in habitat in Southern California. The blooms were blasted for some reason but still a great looking plant. 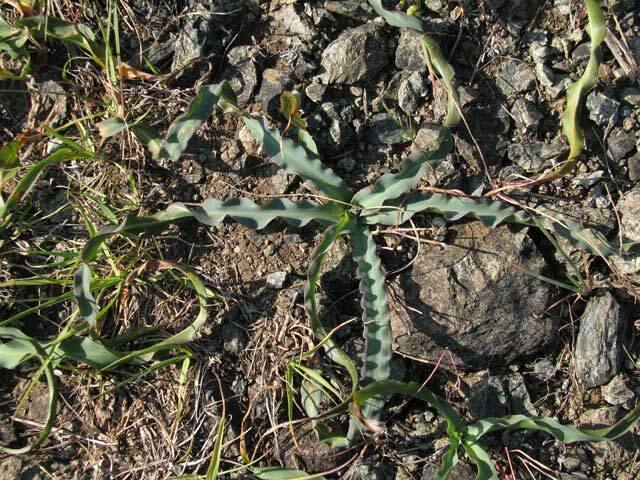 Photo 6 shows a plant found on Ring Mountain, California on serpentine. This form has leaves that are glaucous blue. The photos below were taken in habitat by Nhu Nguyen. Photo 1 was taken in Henry Coe State Park, CA. Photos 2-3 were taken on Mount Diablo. 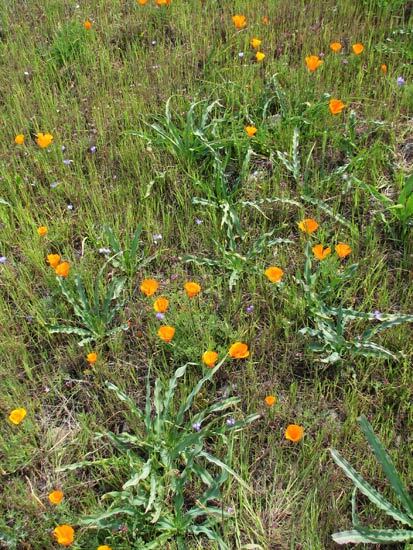 Photo 3 was taken in April 2010 of many plants growing in conjunction with California poppies and Dichelostemma capitatum. The photos below of various aspects of the flowers were taken by Nhu Nguyen on Ring Mountain, Marin Co., CA in June 2010. Variegated forms can sometimes be seen. 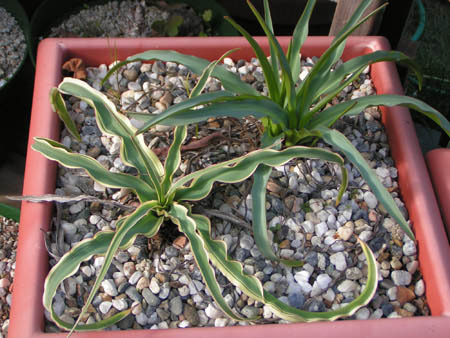 Here is an example of a marginata variegated form. Two year old seedlings of self-pollinated flowers from this plant have not yet shown any variegation. Photo by Kipp McMichael. Here is a pot of seedlings. Some of the seeds were surface sown while others were buried deeper. The picture shows many of the surface sown seeds germinating, suggesting this is the best way to go. The seeds were sown late Autumn 2014 and the first photo was taken Feb 7th 2015, the same time the mature plants emerged in Rogue River, OR. Photos by Travis Owen. 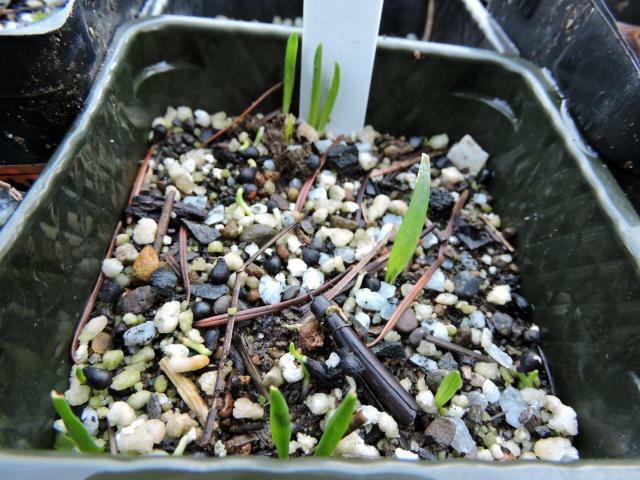 The second photo was of seedling bulbs from the same pot in late June, 2015.